Eponymous albums are artist-defining: Embodying the name of the artist, these self-titled records inherently represent the core of an ‘artistry’, which is exactly what makes A Silent Film’s self-titled third record so unbelievably important. 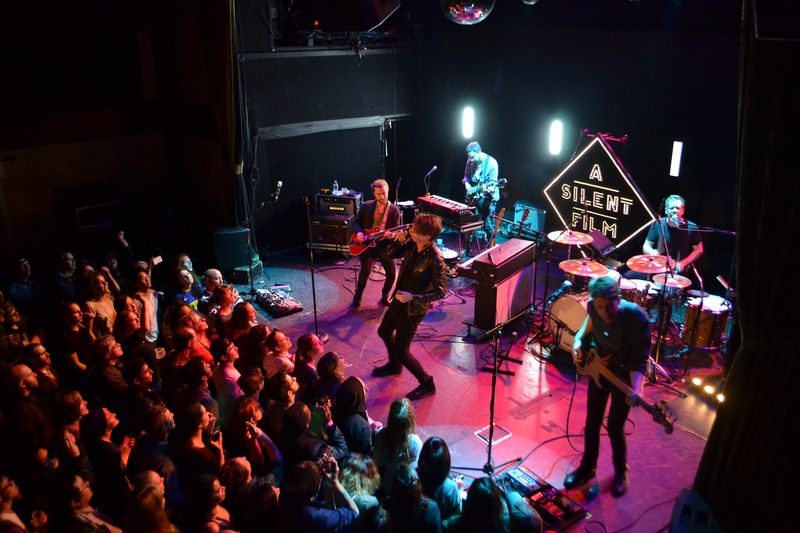 A Silent Film, independently released by the English alternative rock band of the same name in October 2015, marks the band’s conscious and deliberate coming-of-age moment. “This is the most definitive record we’ve made,” asserts A Silent Film’s Robert Stevenson without a second thought. This is A Silent Film’s quintessence: An anthemic set of eleven songs brimming with energy and hope, love and friendship, renewal and loss, tension and release. A Silent Film have never seemed more confident and at peace with themselves. 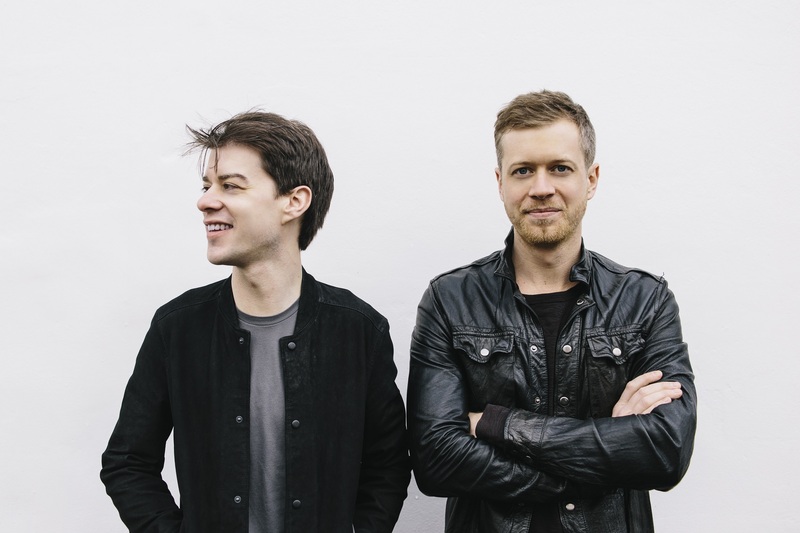 There’s a sense you get, when talking with the independent duo, that Robert Stevenson and Spencer Walker have thought more in-depth and intensely about every aspect of their music than you ever will. It’s a feeling you don’t experience around all artists, but that’s part of what makes A Silent Film special: They try to keep one step ahead of themselves and their fans, without being overly absorbed in the who, the what, the where, and the why of their artistry. They know who they are, and that’s what matters. When it comes to the creative process, Stevenson preaches the importance of ‘instinct’ and trusting your gut: The band holds substance in high regard, striving to create as authentic and enriching (both for themselves, and for others) a body of work as possible. A Silent Film captures a critical moment in time for Stevenson and Walker: The project started with Stevenson and Walker, and after nearly a decade of music and lineup changes, it returned to Stevenson and Walker. Their release of an eponymous record as a duo signifies their commitment to themselves and their embrace of the band’s identity, and A Silent Film indeed captures a refreshed spirit and renewed sense of self. Perhaps A Silent Film is not so much the snapshot of a single moment, as it is a snapshot of a hundred moments all collapsed into one encapsulating record. The significance of those moments – snippets of human emotion and experience – shows vividly in the lyrics and presentation of each song on the album. As passionately as A Silent Film bring these songs to the record, they deliver them all the more powerfully and intimately in a live context. The band is currently gearing up for a set of summer shows throughout North America that will start in late July and run through early September. Coming off their strongest year yet, A Silent Film are sure to dazzle with three albums’ worth of earnest, anthemic content – not to mention new unheard material! 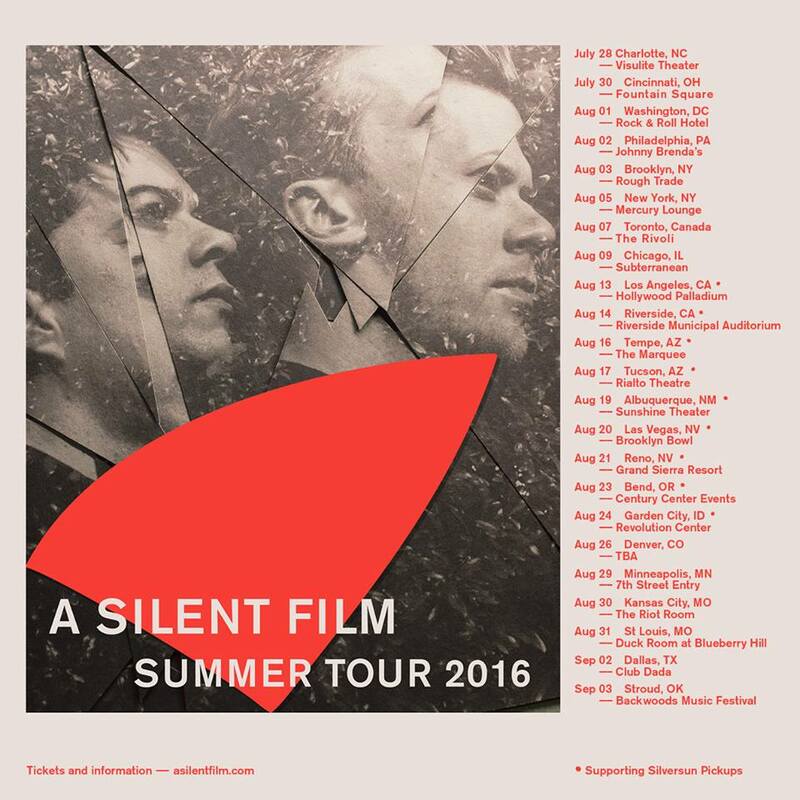 Get to know A Silent Film better through Atwood Magazine’s post-release interview with the band, and be sure not to miss them during their 2016 tour! Time and again, A Silent Film have proven themselves to be among the highest caliber of music-makers today. Their eponymous album only serves to further solidify the band, projecting confidence and self-awareness as A Silent Film move forward into the next era of their career. Atwood Magazine: First of all, I've got to ask: Where were you when your new record came out? Robert: We were in Los Angeles! It’s so strange when the record comes out, because we’ve lived with it for so long up to that point… I guess you sort of hunker down; you don’t really want to hear anything negative, but on the other hand, it’s not a big unveiling! Spencer: Yeah, just kept it pretty cool; had some margaritas! Robert, you told me that, in the past when you've done that, you just can't be around anybody. Robert: Exactly – still… What I can say is that you don’t want to kick it off on the wrong note; you don’t want to hear anything negative, and by that, you can’t necessarily expect to hear a lot of positive, kickass things, otherwise you’d be filtering yourself. So why is this the eponymous album? I feel like this is your most personal album; it's not as flashy - in fact, it's often subdued. Robert: Yeah, I think that’s a fair point there. We’re trying to mature – in a graceful way – and write songs with meaning and create a body of work that has meaning to people, and that’s important to us. How do you balance that with also being a pop act? Robert: You do something with meaning, but then you dance while you’re doing it – and that comes over really well. Spencer: Yeah, and just play it really loud. Is that what gives you joy - having people dancing at the shows? A Silent Film: Yeah – oh yeah, it’s great when people move! We realized this about three or four years ago – I think someone danced at a show, and we were like, “That was amazing! Did everyone see that? They actually danced.” Then we were like, We need to actually encourage this – that felt so good! There's a big group of young kids who come out to support you. A Silent Film: Absolutely, yeah. One thing that’s nice about this band is that we’ve always had a really completely across-the-board audience – which I think is a kind of thing we share with, perhaps, a band with Coldplay. If you look at their audience, it’s men and women, boys and girls – it’s the whole range, and I think that’s important. We write inclusive music; we’re not particularly obtuse, and it means a lot to us. Albums are really long, and we live in a singles world. The artists I've met, the music they make - every single song is painstakingly crafted. There are no throwaways anymore; that's not the world we live in. When the record is done, how do you determine what to put on? Spencer: – lost the spark, a bit. Robert: It doesn’t mean it’s still not going to be an important song, in a way, but you kind of hope that you can get to that really special moment as quickly and easily as possible. I feel like as bands talk about maturing, they talk about not making every song to be the 'hit' song. So what was the hardest part about this album cycle? How was this different from the others? Robert: I think one of the hardest parts of this album cycle would be losing band members as we went. It was, in a way, refreshing, but let’s not kid ourselves – it’s a big upset, because you’ve worked with people for a long time. The wonderful thing was being able to come out the other side all the more stronger, and triumphantly… oh, what are the words? Robert: And it our confidence enormously, doing that writing process because it was just the two of us. That was probably the hardest thing for this one. It's hard when you don't have so many other people to hide behind. Robert: Honestly, I think we revel in that – we love that. We just love to work and move forward, and actually we found that we work so well together! It’s liberating that we can just make very quick decisions, be sure of what we want, and go about it in a very forward-driving way, which is fantastic! I know the definition of 'A Silent Film' is that the band has changed over time, but did you ever have a goal that you wanted to achieve with A Silent Film? Have you achieved that goal? Spencer: I mean, the first goal was really simple – which was like, I wonder if we can actually achieve being self-sufficient as musicians, having a career… And I guess we did that without thinking about it, because you never think about achieving your goals when you’re achieving them; you’re just like, “What’s next? What’s next? What’s next?” For us, we’re ambitious in a creative way, where we’re always looking at the next project – the next tour, the next cycle, just asking, “What more can we do for us, and for our fans?” In a way, with every goal, you forget about it the next day because you go straight on to the next thing. Robert: Yeah, it’s definitely small goals, isn’t it? We take one step on the ladder, and then another step on the ladder – building up. We don’t have any childhood ambitions to be our own heroes; that’s not really the way that we’ve ever thought about making music. One of the hardest things that I think about as a musician is, how do you pare down all the potential sound out there? There are so many frequencies - so many timbres. You hear things from all around the world; how do you determine what not to put on your songs? Robert: I think you’d have to approach it from the other way; start with meaning. It always seems to come back to that for us, with writing. Yes, there’s all those different sounds out there, and those sounds make up sort of genres. Perhaps you have no business in some genres, and perhaps you do – but starting from a place of meaning is very important; and then, being free enough to allow the music to inform itself, I guess, and to not try too hard to reach so far that it’s just… What’s the word? Well, yeah it’s the strangest thing about music! Things gel; things work. Instinct rules: You don’t have to think beyond that, and you probably shouldn’t. Instinct is important to maintain. Have you ever experimented like that and made something that was just totally un-A Silent Film? A Silent Film: [laughs] Yes, loads! And you won’t hear 99% of it. Usually, it’ll be the sketch of the song, or the first draft. We’ll play it to maybe friends and family, or maybe it’ll be something someone else in the band has done and they’re playing it to someone else… They get that look that’s sort of like, “Umm, if you think about it ‘this’ way, I get it…” But within the context of what people expect from… It’s strange; by the time you get to three albums, there’s that level of expectation of what people expect from the band, and then you’ve actually got to exceed that anyway; it’s your duty. I always wonder, is 'cohesion' something that's worth aspiring to? I talk about albums having a sound, a signature something. Spencer: We definitely were heavily influenced by Queen albums and those great albums where you could have the most disparate songs on the record, but when I listened to those as an eleven or twelve-year-old kid, you never even questioned that those songs were next to each other. It was just, that was what that album was, and it made total sense. I think we’ve never set out to make albums that sound very similar all the way through; I don’t think that’s really us, and I think we’re probably going increasingly further in that direction as we go on. In theory, the thread should just be that you’re listening to an A Silent Film record, but hopefully that record doesn’t sound just like ten songs that sound the same. Robert: No, definitely not; it’s just me, and the damn voice. I’m the only thing you can’t change. Spencer: [to Robert] You’re the thing holding us back; you need to develop a new thing for the next album! Robert: Yeah, I know… The voice. Spencer: Just do the whole thing as spoken word. Do you guys listen to any new music? Spencer: Any? Yeah, tons! I think it’s important. It’s kind of like, your job as a musician – in a really grand, sort of epic and universal kind of way – is to be part of this giant ball of popular culture that’s moving forward, and it’s been moving forward since human beings decided to get together and make music. To sit in the past and rehash a ‘retro’ sound, to me, just seems a little bit, like, masturbatory. You must think in terms of where your place is within this big ball of music that’s moving forward. You must think in terms of where your place is within this big ball of music. Making music and touring, to me, seem like such separate entities. You're recording something and in this creative process, and then you stop that and show it to the world. They're like two different jobs. Well, Led Zeppelin II was recorded in a van moving across the country. Robert: Exactly! So if there’s a way to do it, maybe that should be our next goal. Robert: But it is important that the music doesn’t get rushed for the sake of just getting back out to the touring cycle; the music is important, and every artist has a responsibility to treat it as such, I think. That makes sense - I mean, you guys really eased into A Silent Film, too. You started off with the Secret Rooms tour, giving it a very intimate feeling and getting out to meet people. Spencer: That was really important to us, to do that – like an animal coming in from the zoo, into the wild again. It was great – felt so good! And now, we’re back out playing proper big live shows again, and this feels amazing too. We’re probably already thinking about the next thing, which we probably can’t tell you about, and we’re already deciding what the next thing’s going to be because we’re excited about it… Yeah, I think it’s going to be a really fun year, and these songs lend themselves to an incredibly fun live show. This is the most enjoyable live show we’ve ever done, so far! Robert: We’ve got a great band with us, who finished the record with us. It’s a very happy van; that’s all we have to say about that. Spencer: We’re just incredibly lucky right now; everything’s going pretty well! Do you ever struggle in terms of which one you want to be doing and focusing on? Robert: No, I think when it feels right, it’s right. Spencer: By the time you finish touring an album, you’re already ready to write and record – and then by the time you’ve finishing writing and recording, you’re desperate to get on the road. I don’t know whether we’ve been lucky so far, but that’s always been the way for me. Robert: The schedule’s made itself, yeah. What do you do during those pauses when you're not in the van? Robert: We immediately sleep [laughs] – no, I’m kidding. We try and make the most of the experience of being out here. It would be a real shame if, after all these years of traveling and the amazing places we go, if you didn’t have good stories and experiences of it to tell people and remind yourself of. We always try to get out and check out our surroundings. Spencer: It’s the cities and it’s the people. We’ve done this enough that we actually have people in every city, and it just makes it so much more fulfilling when you get to actually reconnect with people again and again, and build friendships and build experience. No city feels that alien to us anymore; there’s a story about the city somewhere in the van, so it’s fun and it just gets more fun the more we do it, which is cool.